In Ancestral Links, John Garrity quotes a recurring conversation between a visiting golfer, about to tee off on an Irish links course, and his caddie. “What’s the course record?” the golfer asks. “Two days without rain,” is the response. It’s a running gag, of course, but it’s also true that vacations in Ireland can devolve into slogfests of wind and precipitation, which is why it’s always good to have indoor alternatives like hanging out at a pub. The prevalence of meteorological mayhem is also the reason this reporter is powerless to resist the urge to gloat. Not only have the Golf Road Warriors never been rained out during our foray through northwest Ireland, we’ve worn shorts every day – those of us with the legs for it, anyway – and have experienced overcast skies only during our round at Carne. It has sometimes been breezy, but never howling. What’s more, this has been more or less my fortune during a half-dozen trips to the Emerald Isle over two decades — including visits in the notoriously marginal months of May and October — during which time I’ve been truly and thoroughly doused only twice, once at Royal Portrush, once at Ballybunion Old. 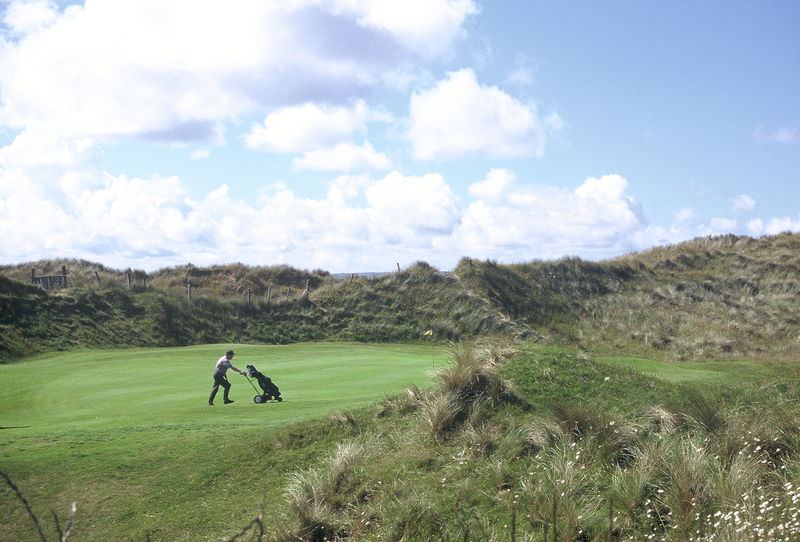 That’s one of the reasons our return to Ballybunion – on what one of our caddies called the best weather day of the year, so far – was such a thrill. Garrity’s 2009 book is a great prelude to any trip to Ireland’s northwest. Subtitled “A Golf Obsession Spanning Generations,” it’s the story of the author’s sabbatical to research his family’s roots in and around Belmullet. Certainly it helps to be a golfer in appreciating the tale woven by Garrity, a senior writer at Sports Illustrated. But his story is also part travelogue and also paints a distinctive, often harrowing, portrait of the region’s sometimes tumultuous history. New American Library.